INDUSTRY.co.id - Bandung, Yesterday (Saturday / 26/5) has been done laying the first stone construction of the Great Mosque of Al Jabbar in Gede Bage Bandung. Insya Allah, please pray from all, in 2019 Al Jabbar mosque is already used by 93,000 pilgrims. 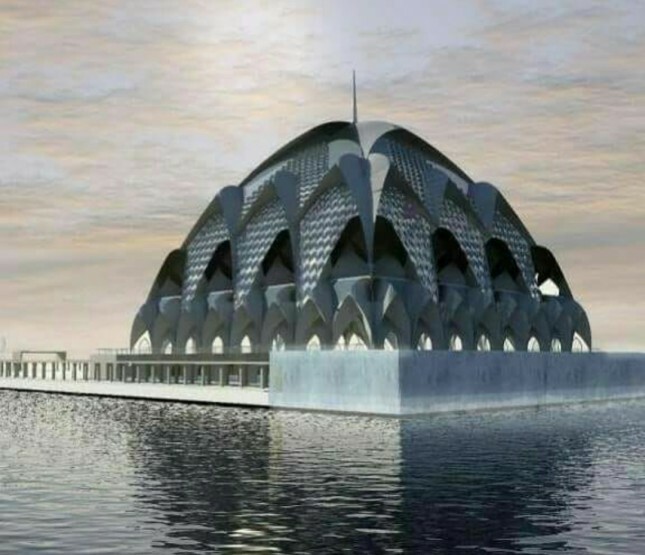 This mosque will be one of the unique mosques in West Java because it is located on the lake of retention. Later, the mosque is not only a place of worship but also a place of education because in it will be built history of prophet museum and history of Islamic development in Indonesia and West Java. Built on an area of ​​21 hectares. Of the area, 10 hectares of land of which has a depth of 3 meters as a water reservoir that has been approved BBWS and central government. The rest, covering an area of ​​11 hectares for the mosque and all its fittings. The size of the mosque is 99x99, which symbolizes the number of Asmaul Husna. There will be four towers built, three of which are 33 meters tall. Figure 33 illustrates a series of wirid tasbih 33, hamdalah 33, and takbir 33. So 33 times 3 towers are 99. That number of asmaul husna. Hopefully all those who participate in the construction of this Al Jabbar Mosque, starting to give ideas, who budgeted, who became a contractor, who provides sand, and anyone involved, enter the category of building a mosque, so awakened by Allah SWT a house in heaven later, aamiin .